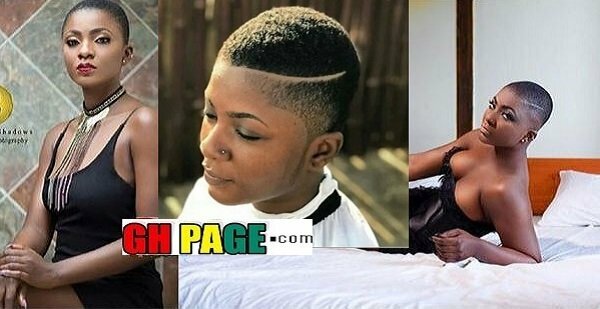 Popular Ghanaian celebrity actress, Priscilla Opoku Agyeman (Ahuofe Patri) has been spotted in a latest photo with a crazy haircut and fans can’t keep their mouth shut on it. Clearly, in the spotted photo, Ahuofe Patri carries a haircut style which is normally dressed by men with a deep ‘fashionista’ line popularly called ‘Aboi’ drawn on the left side of her head. Ahuofe posted the controversial photo on her Instagram page with an appreciation caption which is meant for her barber for his good work and her pretty look. “The Celebrity Barber is too Good ??? ?,” she wrote. However, the caption together with the controversial photo seems not to be attracting any admiration as it has sparked some mixed reactions from her fans, some of them objecting to the praises.